Dunedin-based Cargill Enterprises is experiencing huge growth as businesses from around New Zealand are utilising its products and services, says Cargill Enterprises CEO Geoff Kemp. The social enterprise employs 88 people who have some level of disability with ages ranging from school leavers through to retirees. Geoff says the aim is to provide equal opportunity for training and employment and that there are many ways Cargill Enterprises can assist its business customers that include Air New Zealand, Tuapeka Gold Print and Vinpro. For example, Cargill Enterprises produces, for both export and domestic use, pallets, fruit bins, shipping crates and other crates, trays and holders for the wine and fruit industries. The company also produces stand-alone products such as picnic tables, dog kennels and planter boxes which are sold through retailers or direct to the public. Cargill Enterprises can also partner with businesses to develop solutions to suit their unique requirements as it did with Escea, a Dunedin company selling gas and wood fires. Cargill Enterprises developed special crates and boxes along with polystyrene packing material. Another big customer is Air New Zealand. Cargill Enterprises untangles, sanitises, tests, fixes and packs its headsets from the Queenstown International airport. Newer services are constantly being offered to meet customer demand such as warehousing and distribution which sees Cargill Enterprises holding stock for clients then packing and distributing it on order. The service has been going about a year and a half and Geoff says it has been incredibly popular. Another newer service is e-waste recycling. University of Otago, Otago Polytechnic, SDHB and DCC Rummage are major customers and Cargill Enterprises has also partnered with local businesses such as office technology company OneCall to enhance its offering to its customers. “It means they can offer their clients a complete solution from supply of new technology to responsibly disposing of their old technology in an environmentally friendly and ethical way,” explains Geoff. Other services offered by Cargill Enterprises include timber processing, food packing, packaging, product assembly and mail outs. 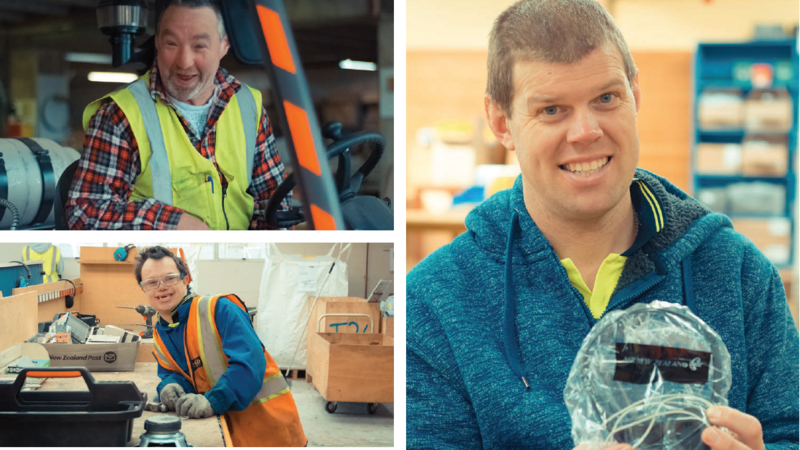 Geoff says the businesses that utilise the products or services of Cargill Enterprises are directly helping to employ people with disabilities and make a positive social impact, something that enhances their business reputation. Cargill Enterprises was started in 1960 and the growth of late has been huge, says Geoff. While the aim is to give people with disabilities options and the starting point is usually a job with Cargill Enterprises, the overall aim is for people to be able to be employed outside the organisation. There is just one problem – most staff love it so much they don’t want to leave, he says. “People that come here to work like it and tend to stay. Visitors who come in here say ‘everyone is so happy here’. So our goal is now to provide more opportunities for people within Cargill Enterprises as we are in a growth phase,” he says. People working for Cargill Enterprises are treated like any other business employee with employment agreements and personal development plans. They are expected to fulfil workplace obligations, be punctual, work the agreed hours, pay taxes and contribute to Kiwisaver. Training opportunities enhance skill levels and enable progression. For example, recently 21 staff from Cargill Enterprises graduated from a one-year programme in workplace communication, literacy and numeracy. It was a big deal as Geoff says for most of the graduates it was the first time they had studied as an adult. Some of the older learners were placed in institutions as children and so had little or no childhood education. Cargill Enterprises is aligned with the United Nations Sustainable Development Goals to ensure that people with disabilities have options.